Hello. We are Barbara and Eric Goodchild of Barberic Farm in Shelburne, MA. We are going to tell you about our handspun wool yarn. Handspun yarn is yarn that is created by “hand” using just fingers, simple sticks, or more complicated machines run by people power, to twist fibers into heavier string than the original fiber. This twisting holds the many short fibers together to create a stronger and longer “string” to make items from. On our farm, handspun starts with our Romney sheep. Care is taken all year to keep the wool on the sheep as clean as possible. The sheep are fed from pastures free of high weeds and grass, with seeds that could get into their fleece. In the winter, once the sheep are off of pasture, and in the barn full time, we put coats on the sheep. A sheep coat is much like a dog coat. Extra nutrition is given to the ewes (female sheep) when they are nursing their lambs, to keep the fibers strong while there is a big drain on the ewes natural resources as she feeds her lambs and grows her new fleece. 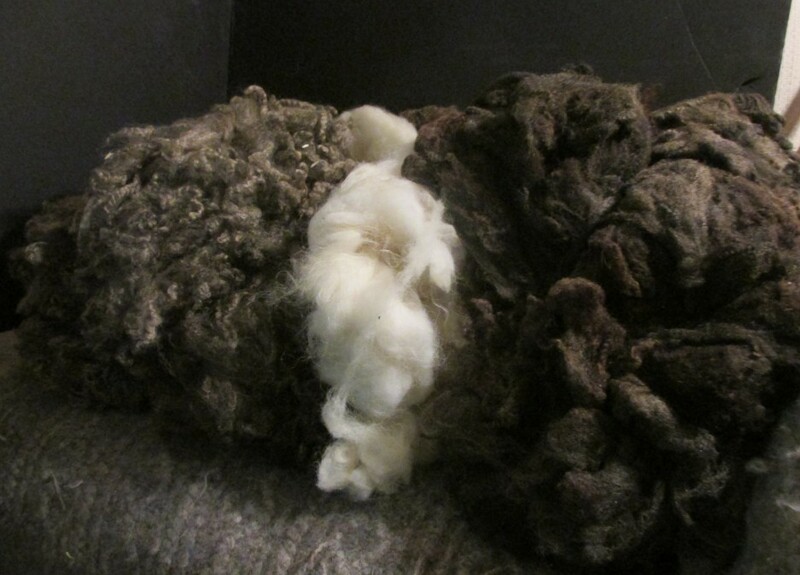 If a sheep becomes under-nourished or sick, this can cause the wool fibers to become thin or brittle. This will cause a weak spot in the fiber that will break while being made into handspun. Shearing time on our farm is in March, about 4-6 weeks before lambing. At that time each fleece is skirted to remove the dirty fleece and vegetable matter, weighed, measured, and labeled with the sheep’s name. Fleeces are stored in brown paper bags until they are sold or sent to Still River Mill in Eastford, CT to be made into roving. Roving is a continuous length of washed, combed fibers that we use to spin into handspun. The spinning of the yarn is done on our Ashford spinning wheel, which is powered by a foot pedal that causes the fly wheel to turn that powers the spinning apparatus. Handspun wool yarn can be spun fine, medium or thick. Just like commercially made yarns, the yarns thickness is defined by a number system. Lace is #1. Sock is #2. DK or light worsted is #3. Worsted is #4. Heavy worsted is #5. And Bulky is #6. These weights allow the knitter to know how best to use the yarn. Once the yarn is spun, we can ply 2 or more strands together to make a thicker or variegated colored yarn. Once the bobbin on the spinning wheel is full, we remove the yarn and put it on a kniddy-knoddy. This stretches the yarn to prevent tangles, and makes what is called a skein. After plying each skein is soaked, drained, squeezed to remove the water, and hung at full length with a weight at the bottom to dry. This process sets the twist of the yarn. After the yarn is fully dry, we measure the skein’s length, weight, and thickness. Now it is ready to be made into beautiful wool garments or crafts.